Colour temperature switchable downlights became increasingly popular throughout 2017. Now almost every lighting manufacturer has a version of their own, but what’s so good about them? And which one is the best? Also known as CCT (correlated colour temperature) adjustable downlights, these types of lights provide you with the ability to change the colour temperature. Within one downlight, you have multiple colour temperatures that range from warm white to cool white. The variation of colour temperature ranges from each brand. Colour temperature is measured in degrees kelvin and is shown with the letter K. The higher the kelvin rating, the whiter and then bluer the light becomes. A light with a 6500K rating would mimic daylight effects, like a clear blue sky. Compared to the lower end of the kelvin spectrum which is 2700K, which would have a more warmer, orange glow. Changing the colour temperature is done differently on each downlight. Some CCT downlights are adjusted by small dip switches that are located either on the front (under the bezel), or on the back of the downlight. The dip switch design should be called CCT select-able. Depending on your main reason for wanting a downlight that changes in colour temperature; you may find that downlights with switches located on the back have a design flaw. So its important to understand what you’re ordering. The ones with switches on the back are flawed as it’s unlikely you’re going to want to remove them from the ceiling to change the temperature, especially if you’ve got lots in a room. They would only be beneficial for users who are unsure about which colour temperature to choose at the ordering stage. Users who want to edge their bets by installing something that contains everything. Or if you think you might want to make a change every few years, or possibly for rented accommodation. Even the versions with switches located on the front aren’t always ideal as you’ve still got to get the step ladders out, remove the bezels and change each light. Then repeat this process every time you want to make a change, with each downlight in the room. If you plan to change the colour temperature regularly then I would recommend choosing one that can be changed by a wall switch or remote control. The Centurion by Amitex for example is controllable by switching an ordinary light switch or by ordering an additional remote control. Or the Halers H2 Pro 550 CS is also controllable by a light switch, by switching the switch on and off within a few seconds, the colour temperatures switches. Although this design isn’t always perfect as they can be changed accidentally especially by those pesky kids! The main advantages of CCT adjustable lights are that you’re not stuck with one colour temperature and you can change it depending on the function of the room. Providing you with the flexibility to make a change whenever you want to. Without needing any electricians and without any additional costs! You may have cool white in your kitchen but are having guests around and would prefer to switch to something warmer? You may have a home office with cool white but want to be more relaxed to encourage those creative juices to flow under a warmer setting? Or maybe the kids won’t wake up in the mornings so you switch to daylight 6500K and set it to full brightness? Sometime in the future you might have plans to redecorate your living room and go from an ordinary, homely ambient tone to something whiter and more modern. Rather than replacing all of your lights to keep up with their new environment, you just change their colour temperature and keep them. Providing you with an instant, new tone of light. Or maybe you change the colour temperature and you hate it? Just switch it back, no expense and no dramas. A common problem for electrical contractors is that they install downlights in a room and the client doesn’t like the colour temperature. Rather than sending them back or living with something they don’t like for years, CCT downlights can be changed by the flick of a switch. This is another reason why they are becoming increasingly popular. Electrical contractors love them and can help to keep their customers happy, even if its the customer who ordered the lights incorrectly in the first place. Most of the versions we sell are dimmable as standard, so whichever colour tempertature you’ve set them to, the lights will dim in brightness. This is except for the commercial grade Ansell Galaxy downlights that are available in 13W or 20W versions. As they dim in brightness, the colour temperature will remain consistent. If you want something that reduces in colour temperature as it dims in brightness, then that is whole different type of product known as Dim Tone, Dim to Warm and many other variations of this exist. 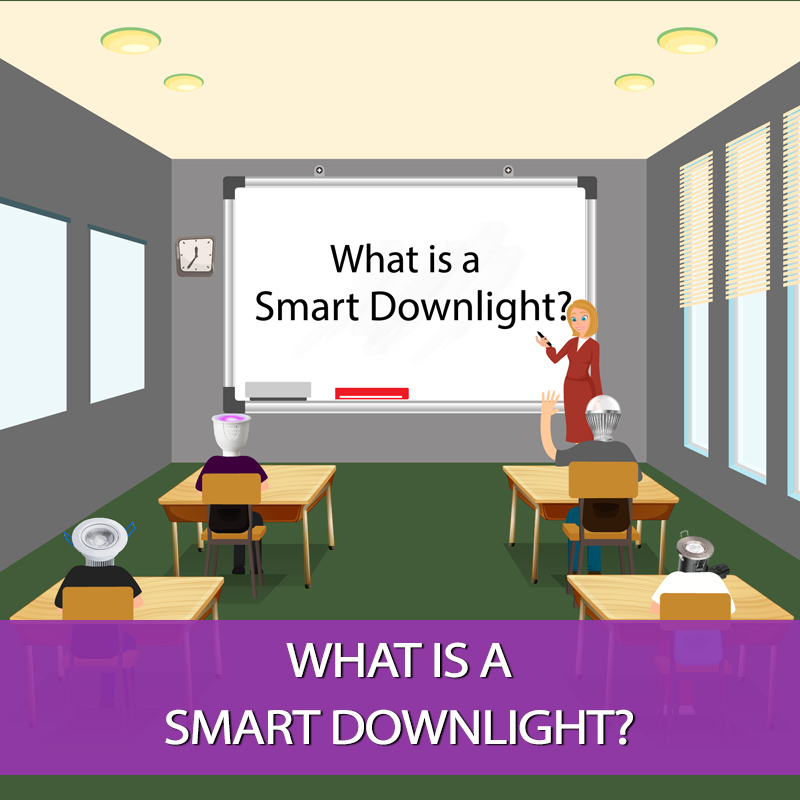 Mimicking the dimming style of halogen and incandescent, Dim Tone and Dim to Warm lights become warmer the lower they are dimmed. Philips Lighting invented this technology in 2013 and its become a standard feature in some of their LED lamps including their Master Value 4.9W GU10 LED. I’ve used six of the best selling brands in our comparison table. Each one is fire rated and dimmable as standard. 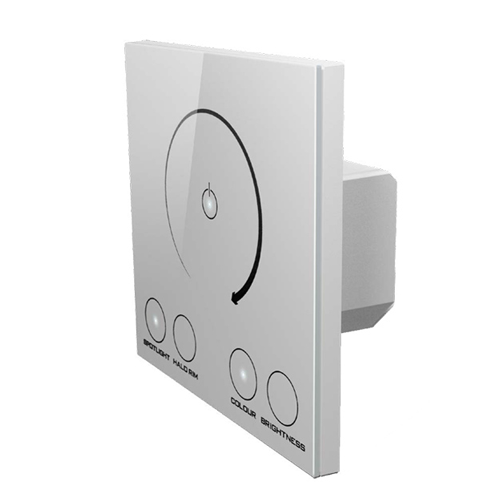 Each one has an IP rating of IP54 to IP65 meaning they can all be used in bathrooms or in any room you like. This was one of the first CCT downlights on the market and although it was one of the first it features the best control technology. This is the only one on the list that has its own remote control, allowing you to easily change the colour temperatures from your armchair. Or it can be changed by a traditional light switch. The wider cut out size of 95mm also allows it to fit into larger hole sizes, its supplied with 3 bezel finishes and has 3 colour temperatures including 3000K, 4000K and 5000K. Supplied with 3 different bezel options and 3 colour temperatures, you’re essentially getting 9 downlights for the price of one. This is a great product for electrical contractors who want to stock something themselves. They could turn up at a job and install the downlights there and then. The customer can choose the finish and the colour temperature they want. Since originally writing this news piece, the E8CX has been discontinued. I suspect that demand was low due to the the design defects I’ve highlighted. But it was a CCT replica of the popular E8 downlight, which includes 3000K, 4000K and 6500K. This is available with an optional bezel. Featuring Aurora’s Enfiniti lens which is an edge to edge light array. The Enlite E8CX is also insulation coverable, fitted with an ICC (insulation cover cap), you lay thermal insulation directly on top of it. The Click Omni has some totally unique features. Along with its 3 colour temperatures of 2700K, 4200K and 6500K, each colour option has its own beam angle. Both the colour temperature and beam angle change when you flick the switch which is located on the rear side of the downlight. Like the other contenders, the Click Omni is a fixed position downlight but an optional adjustable bezel accessories is available. This allows you to convert it into an adjustable (gimbal) style downlight which is great if you want to direct the angle of light. This is also insulation covereable as standard and comes fitted with an insulation support guard. It is supplied with a Click Flo connector which helps to speed up wiring. This is the colour temperature adjustable version of the popular Halers H2 Pro from Collingwood Lighting. The H2 Pro CS which stands for colour switchable has a temperature range of 3000K, 4000K and 6500K. This is switchable by using a conventional light switch. As its dimmable you’d use the push-on, push-off function of the dimmer switch to change between the colour temperatures. Fitted with a Collingwood T block connector block, wiring is faster and easier. With push-fit, loop-in, loop-out connections, these downlights can be wired without having to use a screwdriver. The latest entry to the marketplace which offers great value for money. Available in a fixed version which has the switches on the front behind the bezel. And in an adjustable version, known as the V50 Tilt which has the switches on the back. This is available in 5 finishes including black and bronze. If you’ve got existing large hole sizes, you can order a hole converter plate. For anyone that’s familiar with JCC downlights, with its 600-650 lumen output, the V50 is brighter than the FGLED6 and more compact than the FGLED3. It’s a great cost effective product that can be used even if you’re not bothered about changing colour temperatures. Insulation coverable and available with a selection of accessories that include converter plates and hole concealer rings. These are ideal fitting it into larger ceiling holes making it become an even more universal product. The JCC V50 could become the ‘go to downlight of 2018’. The images don’t really do this product justice, the compact lightweight design is going to set a new standard for downlights for 2018 and beyond. Further information about this exciting new product can be found on the JCC Lighting website. This is the latest edition and by far the most advanced product in our CCT downlight collection. 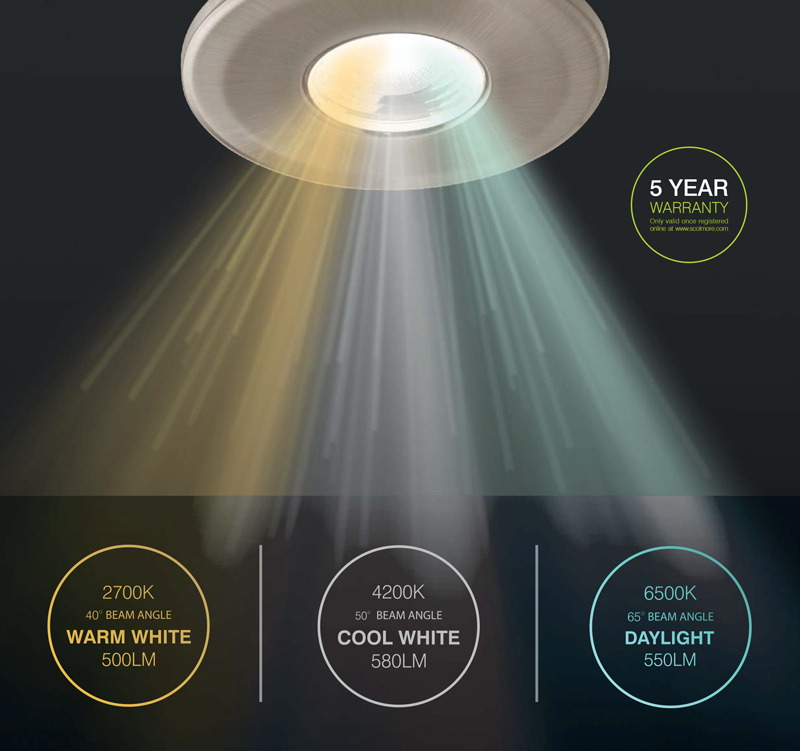 Not only does it have the widest colour temperature range of 2200K-6500K, it also has a colour changing halo. The colour changing halo provides you with the option of having thousands of different lighting effects. Controllable via bluetooth using the App which is free to download and available at Apple App Store for Apple iPhone use or at Google Play for Android devices. You can independently control the colour temperature and colour changing halo. Mixing any colour temperature with any colour of halo. Also controllable via the new wall controller, which offers local control. Ideal for use when you don’t have your smartphone handy or for guests to adjust the lights with without having to open the App. The Crompton Sprectum can be linked into groups, allows scene controls and timed functions to be set. It’s like having a smart lighting system in your pocket. It can be anything from just one downlight to hundreds spread across various rooms. The patented design might just be one of the greatest downlight innovations in history. It has all of the mod-cons, fire rated, IP65, dimmable, it has it all. As well as being supplied with 3 bezel attachments in 1 package, you can choose between white, chrome or brushed aluminium. Other bezel finishes are also available on request. The best of the bunch are the Amitex Centurion, Crompton Spectrum and the JCC V50. The Centurion is great for its ease of switching between the colour temperatures. The optional remote control puts it in a league above the rest. Its also the brightest and has a nice wide 90 degree beam angle. Its quite wide though but than can be advantageous if you’ve already got large ceiling holes. The Crompton Spectrum has best range and is definitely the most technologically advanced but it does come with a premium price tag. The JCC V50 is also great due to its brightness, compact design and competitive price. Although if you’re seeking a specific colour temperature like 2700K for example, then the Click Omni would be your best option. It does depend on the range of colour temperatures you want to get from it. As you can see, their are many advantages of colour temperature switchable LED downlights. When a room can have multiple functions, why should it only have one colour temperature, especially in this modern age of technology?